Intarsia Sweaters: I love it when sweater weather arrives. One of the biggest sweater trends from the past two sweater seasons has been whimsical knits with some sort of character on the front. They were a huge hit at J Crew Last year, and I'm So excited they're back! That camel sweater? Swoon! The Perfect Plaid: What's fall without the perfect plaid shirt? Actually, one of my very favorite fall shirts is a men's plaid flannel I got on sale at J Crew last year. It's so comfy, and it's perfect to throw on with a pair of leggings and boots. I can't get enough of it. Or any other plaid for that matter. 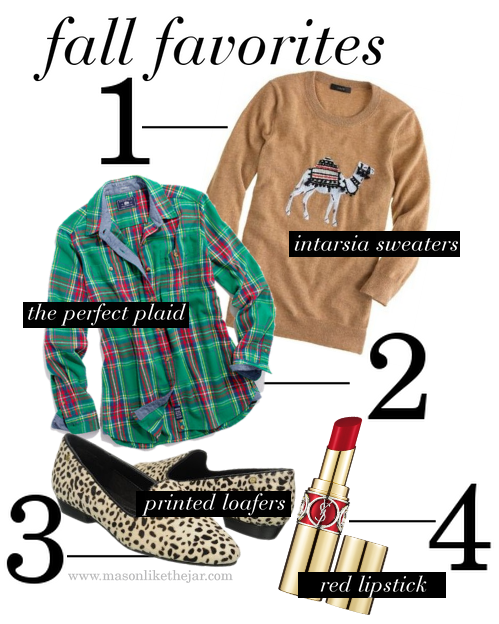 A few more "perfect plaids"
Red Lipstick: Fall is also when I bring the red lipstick back out. I love the sharp pop of color it adds to an outfit, and it immediately makes you look 100% more put together and just the right amount of fancy. What are your fall essentials?? ?